You learn a foreign language. So maybe you wish to try it out to see if you can make yourself understood or not. Or probably some of you guys want to make friends abroad. Want to do so? But you don’t know how? If so, I recommend you sign up at a language exchange website. These websites are a platform for those who want to make language exchange partners. Their primary service is to have native speakers correct your writing. 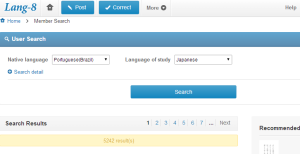 If you learn Japanese, I recommend you to join lang-8, a site started by a Japanese guy whose parents are Chinese. More Japanese users have signed up at this website than at italki. Lang-8 users post more writing entries than at any other sites. Most of users at a language exchange site update very few entries or none, but lang-8 users are much more serious. In addition to casual pen pals, italki also serves as a platform for skype lessons by native speakers. You can find professional or amateur teachers on this site. You can use your new language on skype. I’m sorry to tell you, but it’s not free. Another feature of italki.com is Discussions. You can post a topic and it’s open to all the users regardless of their language.You can experience different views from different countries. This is a true international interaction. How to use lang-8 and italki? Nobody corrects my writing. What should I do? Write an interesting entry that will catch people’s eye. A short entry gets a warm welcome. Do not post too long an entry. We feel so bothered to rewrite long entries that we could end up doing nothing. The ideal length of one is up to 100 words in alphabet languages like English, up to 300 letters in Japanese and up to 200 characters in Chinese.